All NEW! We've just getting started here, but already we have some interesting ideas for conversation and script writing practice, with pirate lingo to make it extra fun for the kids! Here's a great activity to get the kids thinking a bit about what it would be like to live in the past. Can they write a letter to Sir Francis Drake explaining why they should join his crew? What qualities do you think he'd look for in a shipmate? Our Anne Bonny booklet is a great place to record all the information the kids have learned about the famous female pirate. Choose from our lined or blank version, and refer to our origami booklet page for instructions on how to fold the booklet. Our fun worksheet asks the kids to imagine they are a talk show host interviewing Anne Bonny. What kind of questions would the audience want to hear? And how would you get the famous pirate to give the best answers? Can the kids use our newspaper writing prompt to write about an interesting event in Anne Bonny's life? How about when she was captured but managed to have her life spared in prison? Here are two Anne Bonny notebooking pages to choose from, so the kids can record what they have learned about the famous pirate. Anne Bonny was certainly an interesting character and she had an eventful life - our worksheet asks the kids to find out some basic facts about her, but also asks them to think if they would like to have met her and what they would have talked to her about? Our Anne Bonny writing page comes in black and white or colour, and is perfect for younger kids to record some facts that they have learned about the famous lady pirate. Our Blackbeard booklet is a fun way for kids to record everything they've learned about the famous pirate. We have blank and lined versions to choose from. Folding instructions are here. Can the kids imagine they are a talk show host and that they are interviewing the famous pirate Blackbeard? What sort of questions would they ask? He might be a tricky person to get to talk, so how would they encourage him to give some good answers, and what would the audience want to hear? Here's a fun activity for the kids to try. Can they use our Blackbeard newspaper writing prompt to a write about an event in his life - maybe the one time he gave up piracy, or a report on his final battle? We have two Blackbeard notebooking pages for the children to choose from for their project work - both pages feature an illustration of the fearsome pirate. Perfect for older children, they come in a choice of lined or with a box for pictures. 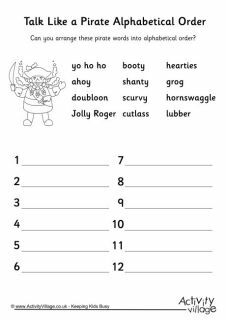 Younger children can record what they've learned about the famous pirate Blackbeard using our fun writing page - we've got two versions to download, colour or black and white. Were privateers really just pirates who were on the right side of the law? Older kids can use our venn diagram to show the main differences and similarities between privateers and pirates. The results might be surprising! Sir Francis Drake received a knighthood from Elizabeth I for his services to her and the country. Our printable asks the kids to design their own award for the famous Elizabethan sea captain. This Francis Drake comprehension worksheet is aimed at older children. They need to read the text and use it to answer the questions at the end to show that they have understood it. Learn a little about Sir Francis Drake by reading our printable factsheet. You can also use it alongside some of our Francis Drake worksheets. Here's an interesting worksheet to get the kids thinking. Sir Francis Drake became a knight because of his adventures, and Queen Elizabeth I thought he was brilliant. Here's an interesting challenge for the kids. Can they imagine they are a talk show host interviewing Sir Francis Drake? What would you ask him about his adventures? Write a newspaper report on one of Sir Francis Drake's exciting voyages using our newspaper writing prompt. This worksheet is designed to get the kids thinking about what it would be like to meet Sir Francis Drake and what they would talk about, and also find out some basic facts about the famous privateer. There are two versions to choose from, colour or black and white. Our Sir Francis Drake writing page is designed for younger kids to record what they have learned about the famous sea captain. Choose from colour or black or white. Pirates often had a strict code of conduct on their ships, which was a set of rules all about pirate life. Kids can write their own code using our worksheet - will anyone be made to walk the plank? Ask the kids to write a newspaper report using this pirate ship newspaper writing prompt as inspiration. Maybe this fearsome pirate ship was captured and the pirates brought to justice, or maybe it was shipwrecked on a remote desert island? Do you know any young scallywags who are wanted for piracy? Kids will have lots of fun with our pirate wanted poster - we have four versions to choose from below, including ones where they can draw or stick in a photo of themselves or someone they know! Here's a fun but challenging worksheet for older kids, to help them practise map reading skills. There's a lovely treasure map on the worksheet, and they need to use the map grid references to answer the questions.